I was born in a hotel room - well, sort of. The Caldwell General Hospital was a grand old structure, which in earlier years, had been the Southwestern Hotel. As a major hotel on the very active Chisholm Trail it had been home to many a tired cowboy. Mom's attending physician was Dr. Barnes. In the same hospital 14 months later Doris Loretta Palmer Johnson would deliver, a daughter, Judith Roxann Johnson, with the same attending physician. Both of our birth certificates have his signature. "The Southwestern Hotel opened in 1883. ... Sometime after that Mellie (Short) became the manager of what has been called 'one of the best furnished buildings in Southern Kansas'. The cattlemen's balls and other social balls attracted the wealthiest people of the area. Ladies in beautiful gowns of high fashion danced with their courtly escorts beneath crystal chandeliers. The hotel also was renowned for the excellence and great variety of its cuisine. It attracted diners throughout the state. Visiting performers and artists who were booked for the Opera House marveled at the elegance of the Southwestern. It was in this period that Mellie leased it. She furnished it with her beautiful antiques, fine furniture, exquisite paintings, and china." Mom always said that she was so certain that I was going to be born on July 4 that she stayed home from a parade. I was born on September 11. My sister says that the Sumner County Fair was being held in Caldwell at the time I was born. Perhaps that's why the Fair always held special excitement for me. Joann had turned 12 in June and had entered 7th grade at the high school, no longer a child (in her own mind, of course). Thus it happened, that my sister was an 'only' child, and so was I. Evidently my conception and birth were quite a surprise to everyone. "Mr. and Mrs. Herman Niebaum are the parents of a son, born at the Caldwell General Hospital at 8:54 last evening. The baby at birth weighed seven pounds, two ounces and has been named Eldon Jerome." Although I remember asking, I don't really remember where my name came from. My sister was EJN (Esther Joann Niebaum). Mom wanted our initials to be the same, EJN, so I became Eldon Jerome Niebaum. Joann retained the same initials when she married a Nulik. Jerome was a name Mom said she always liked. Dad said Eldon came from Eldon Gracy, a friend in the area. Eldon Gracy isn't much older than me, so I think that's just something Dad invented. I have a listing of all the Niebaums in the world and indeed, Eldon Jerome Niebaum is a unique name. My ethnic heritage is quite a mix of English, Scotch, Irish, German, and even American Indian. Mom always said that her Grandmother was half Indian. That always seemed like such a strange way to tell about our Indian heritage. I guess the fact is that no one could recall which of the parents was full-blooded Indian. An early picture of Granddad Smith seems to show American Indian features, but I'm uncertain if that's even the right side of the ancestral tree. Joann and I believe our tribe was Sioux. I've always taken pride and interest in having Indian ancestry. My first home was 6 South Osage in Caldwell, Sumner County, Kansas, near the Oklahoma border. Our home was across the street from the beautiful Presbyterian Church, which Granddad Niebaum had helped build. He was a stonemason. Dad always said there were more whiskey bottles than concrete in the steps and foundation. It was a beautiful elegant old structure. Sadly, it burned in 1956. The Caldwell High Senior class was just returning from their senior trip to Kansas City as it burned. Judy's brother, Morris, was part of that senior class. Granddad was also a stonecutter and some of his stones are still visible in Caldwell buildings on Main. Mom was a Presbyterian and Dad was not. He never had much use for religion, though in his late eighties he did join the church (just in case it was important). 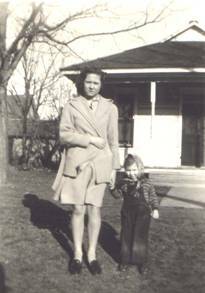 Mom read the bible, taught Sunday School, worshipped regularly, and was a devoted Christian all her life. She played the pump organ at church before the age of 10. Though she never had a music lesson in her life, she played piano really well, and could play any piece after hearing it for the first time. She loved to play loud honky-tonk music with a stylized left hand. I loved to hear her play and it always made me smile. She also had a fine soprano voice and encouraged me to sing from the time I was able to talk. By the time I was baptized in Caldwell Presbyterian Church on May 11, 1941 I was able to talk. Mom wrote in my baby book that, "When 22 months old Aunt Ethel (Mom's sister) was talking to Jerome about his being Baptized and she said, 'Jerome what did the preacher do when you were Baptized?' Jerome quickly answered, 'washee hair'. Then Aunt Ethel asked him how old he was and without any coaching he promptly put up one finger and said, 'four'." Joann tells that "another time in church, when all was quiet, Jerome spoke up and declared, 'This is a good show, isn't it Mom?' I was in choir at the time and totally embarrassed!" Family legend says that I was walking at age 8 months and into nearly everything. Mom had a leather harness with a long strap for me, which she used to keep me from straying whenever we went out. Mom wrote the following in my baby book: "Started scooting backwards at 6.5 months then forward all over the house at 7 months up on the toes and hands. Pulled up to chairs, divan, and beds at 7.5 months. Three days before nine months old Jerome started walking just all over the house. At 10 months walked up to 'Ice Cream Shop (2 blocks) without holding mother's hand." Because of her age and interest, my sister was a built-in baby sitter and spent quite a lot of time with me. According to Joann, Jerome Kern was a popular songwriter of that era. Mom loved to play his songs and Joann loved to sing them. She would swing me in the porch swing and tried to sing louder than I would cry, just to get my attention! By the time I was born Dad was an auto mechanic with Rains Motor Company. Once when I was very young (probably age 2 or 3) Mom and I were visiting Dad at work and somehow a wheel and tire fell on me. I think I pulled it over on myself. They rushed me to the hospital across the street expecting that all my bones had been broken, but I was only bruised a little. I do actually remember that experience, or at least parts of it. In particular I remember Dad feeling so terribly bad that he had let it happen to me. I also remember screaming quite a lot. Dad was a very good mechanic according to those he served. But, he never did like being a mechanic, and he was adamant that I not follow in his footsteps. He told me more than once, only half in jest, "If you ever pick up a wrench I'll hit you with it!" Consequently, I never learned much about auto mechanics until I was grown and self-supporting. More importantly I had no interest in it. When Dad started working for Rains Motor Company in the 1930's he was paid one dollar a day! House rent at that time was a dollar a week. One days work for one weeks rent. When I started teaching junior high school in 1961 after Judy and I were married, my annual salary was $4250. Our rent at that time was about $90 per month. One days work for one weeks rent! Those were tough years for us, too. Dad was such a hard-working, tough-talking man that I never fully appreciated his sense of humor until very late in his life. Though he couldn't speak German, he could recite the German alphabet and loved to show off by doing so. He had some witty phrases he used repeatedly. Many were twists on old ideas that only Dad could give them. I never knew whether they were original or not, and it is unlikely that they were. I offer them here as 'Hermanisms'. "You know, everybody has to be someplace." (When he got something backwards) "You know, you have to take a Dutchman (German) for what he says, not what he means." (When trying to find something) "If I'd a been a snake, I'd have bit it." "You know, people have more fun than anybody."